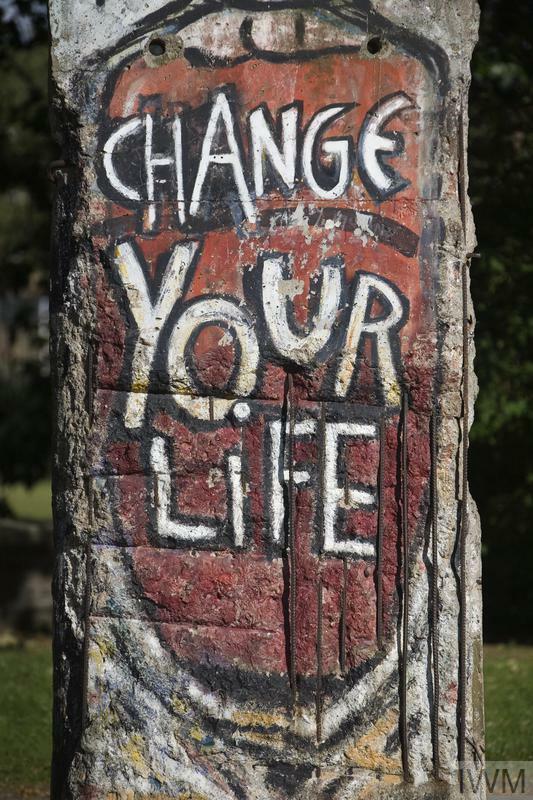 Small section of the Berlin Wall, taken from the Leuschnerdamm in the Kreuzberg district, on which the main item of graffiti is 'CHANGE YOUR LIFE' by the graffiti artist 'Indiano' (Grosse, Jürgen L). 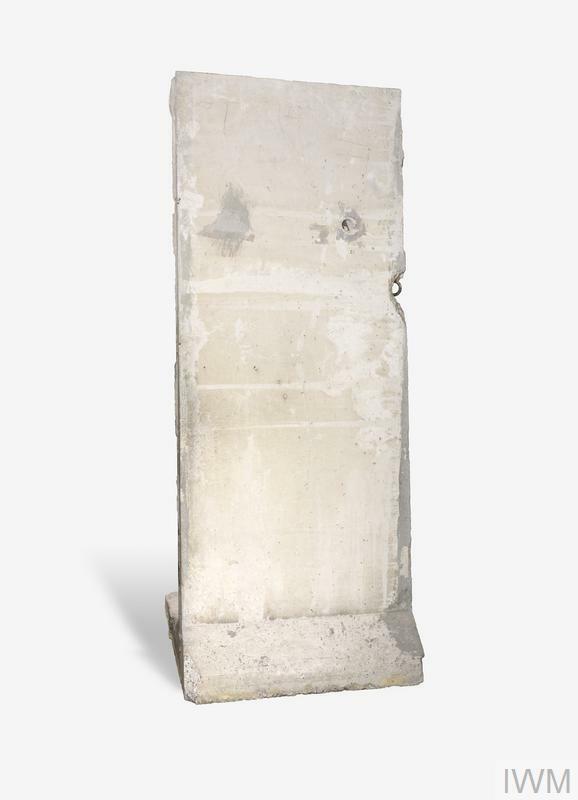 Upright rectangular section of concrete from the Berlin Wall. The vertical steel reinforcing bars emerge from the wall in places. It is painted with graffiti, including a central image of a grotesque distorted face in black outline. 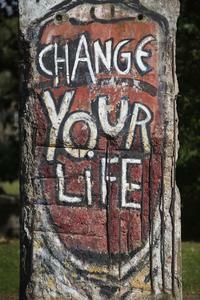 The open mouth is painted red, over which is written in white block letters "CHANGE YOUR LIFE". The reverse is plain. The 'motto' "Change Your Life" used by the artist 'Indiano' (Grosse, Jürgen L) may be from the ending of the poem, 'Archaischer Torso Apollos' ('Torso of an Archaic Apollo') by the German poet Rainer Maria Rilke (1875-1926) which concludes with the words 'Du musst dein leben ändern',' which translated means 'You must change your life.' At the end of the Second World War, Berlin was divided into four zones of occupation controlled respectively by Britain, France, the United States and the Soviet Union. Access to Berlin was allowed along specific corridors from West Germany. The Soviet blockade of Berlin in 1948 effectively resulted in the division of the city into two separate administrative units. In the ten years after the blockade the Berlin problem remained a potential flashpoint in East-West relations. In particular, the growing contrast in living standards between the eastern and western sectors caused many East Germans to flee to the West, using West Berlin as their main exit. For twelve years they fled at an average rate of some 20,000 a month (one estimate is that between September 1945 and December 1965, East Germany lost over 2 million citizens). Since many of the refugees were highly-trained and qualified workers, this was not only a condemnation of the East German regime but also a considerable drain on East Germany's economy. In November 1958, Russia under Kruschev, sought to remedy the situation by demanding an end to the occupation of Berlin and the normalisation of the city's 'status' as the capital of the German Democratic Republic (GDR). From then on the East Germans pursued tactics of whittling away at Western rights on a petty level -e.g. demanding papers from diplomats travelling into the eastern zone -in an attempt to force an implicit recognition of East Germany's right to control her own territory. In early August 1961, Warsaw Pact leaders met in Moscow and Kruschev agreed to East German pleas to be permitted to close the border. 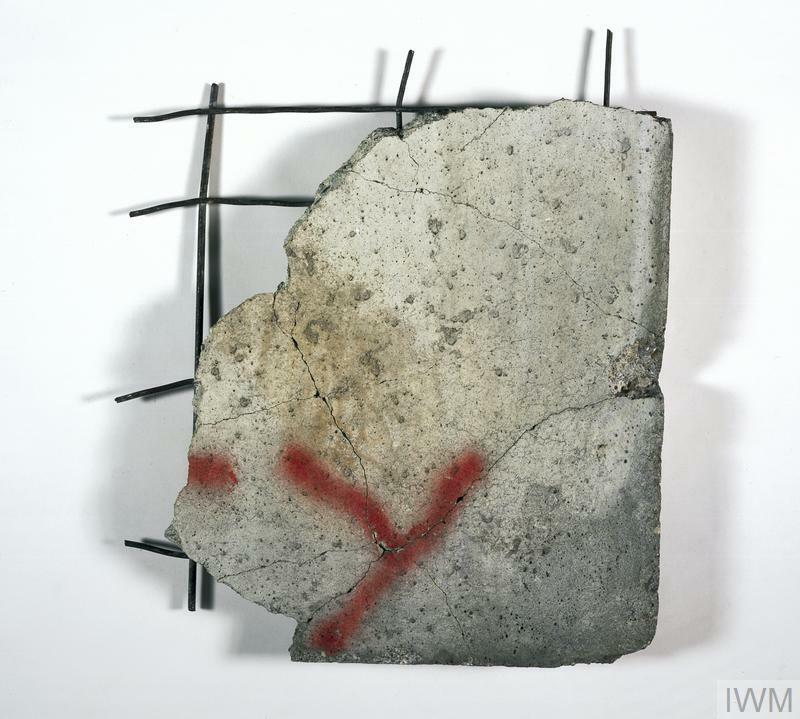 On the night of Saturday 12 August 1961, East German Army and Police units began to seal off the escape routes through Berlin with barbed wire barricades. By 0100 on 13 August all but twelve of the eighty main crossing-points were closed, cutting the city in two. Within a month a wall (initially constructed of stone blocks) was beginning to replace the barbed wire in several places, although the wire was extended elsewhere, even stretching across rivers and lakes. The most significant fact about the wall was that it was built to keep East Germans in and not West Germans out. Of all the recognised crossing-points which remained between East and West Berlin, 'Checkpoint Charlie' on the Friedrichstrasse became the most famous. It served as a focus for the confrontation between US and Soviet tanks in October 1961 when the East Germans violated an international agreement by ordering American military personnel to show identity cards when entering Berlin. In 1963 the stone wall was replaced by a concrete one of 25 kilometres. By 1980 it formed a 164 kilometre ring around West Berlin. The barrier as a whole now had an average depth of 50 metres and also included: a reinforced concrete slab wall up to 4 metres high and topped by concrete or steel tubing to prevent anyone from gaining easy hand-holds (102 kilometres), a close-meshed metal grid fence of up to four metres high (55 km), a vehicle barred ditch, up to 5 metres wide and deep (107 km), a security strip 15 metres wide that was sanded and swept to show up footprints and tracks, a concrete or tarmac road up to 4 metres wide for the ease of movement of the frontier guards, a contact fence about 2 metres high which switched on observation lamps when touched (122 km), a security-trap zone with trip-wires to activate alarms, 247 observation towers, 135 bunkers or shelters and 260 dog-runs each allowing guard dogs on long leashes a 'beat' of 200 metres. Elsewhere, outside Berlin, the frontier comprised a 5km-deep control zone and a 500-metre security strip which could only be entered with special permission at prescribed points. The frontier barriers incorporated many of the same features as those in Berlin. One of the nastier features of the metal grid fence was the installation, at 10-metre intervals over one-third of its length, of SM70 automatic fire and alarm devices. Activated by tension wires, these fired explosive charges containing 90 jagged iron fragments, up to 25 metres. There were also 292 km of minefields. The frontier between East and West Germany (once settled by a joint commission in 1974) was 1,378 km long. 1, 282 km of it was covered by the metal grid fence. From an East German point of view, and in the short term, the Wall appeared to fulfil its purpose. It had somewhat changed the status quo, for any negotiations implied some formalisation of the new situation and recognition of the division of Germany. With the drain on its resources slowed, if never completely stopped, the GDR's economy stabilized and became healthier, enabling East Germany -within a few years -to become the second strongest power of the Warsaw Pact countries. 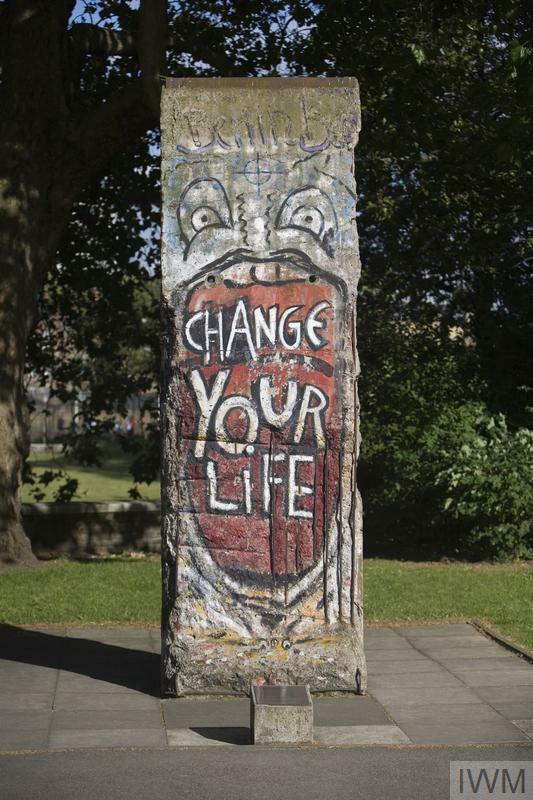 In this respect, the Wall removed a 'running sore' of anxiety for the GDR and so smoothed the path of East-West detente. At Christmas 1963 West Berliners were allowed, for the first time, to visit East Berlin, if they could prove they had relatives there. Then, after negotiations between East and West Germany, and a four-power agreement which came into force in 1972, considerable improvements were achieved in simplifying transit and visiting arrangements. Quick clearance, with fewer controls, became the norm. Nevertheless, the movement was still essentially in one direction, from West to East. In spite of these improvements and better East-West relations, East German citizens continued to leave for the West. Dr Rainer Hildebrandt of the Checkpoint Charlie Museum estimated that 383, 000 left East Germany legally between August 1961 and December 1968, though until 1980 they were mostly pensioners and sick people. Approximately 5,000 refugees per year have also fled. The majority did not escape over border obstacles but left via other countries such as Czechoslovakia and Hungary. A spokesperson at the German Embassy in London said that some 25,000 escaped in 'dramatic circumstances'. These included 57 people who escaped through a tunnel dug under the Berlin Wall itself in 1964, and two families (8 people) who reached the West after a 40 km flight in a home-made hot air balloon in 1979. 192 people are known to have died in attempts to cross either the Wall or the frontier obstacles. The actual figure, however, is likely to be higher. Some 60,000 were arrested for actual escape attempts or for merely planning to escape, the average sentence being 16 months' imprisonment. The Wall was breached on the evening of 9 November 1989 and gradually dismantled in stages thereafter.